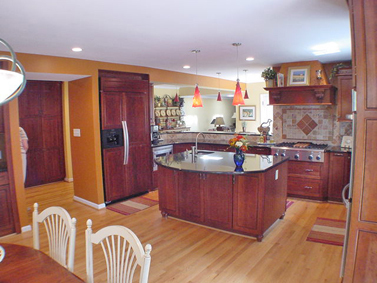 Send in questions you may have about remodeling and one of our associates will post answers to your questions. Thanks for contacting CWC Remodeling, Inc. Brick fireplace fronts can be converted over to stone faced fronts. I'm attaching a photograph of a fireplace which used to be brick faced which was converted over to a stone faced fireplace to include installing a slate hearth and mantel. The stone used in this application is a product called Cultured Stone, a man made material which is commonly used in this application. Below is a link the Cultured Stone web site to help you better understand the product. If my ceiling fan is shaking when on the highest level how do I fix that? The easiest way to solve a shaky ceiling fan is to first make sure that all the blades are properly secured to the ceiling fan motor unit. Sometimes, these small screws can loosen and this could not only be causing a wobbly ceiling fan, but also could be dangerous. 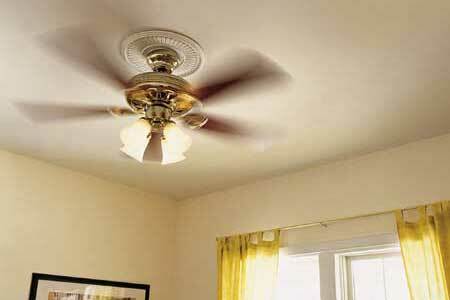 Next purchase a ceiling fan balance kit, available at your local home center. Follow the directions which come with the kit which basically will have you add weight to one or more of the blades to equalize the balance. What is the best way to find a stud in a wall if a stud finder is unavailable to me? You can simply take your index finger and bend it like your making a fist, take your knuckle and tap the wall firmly working in a horizontal direction. If you listen carefully you will hear two distinct differences from a hollow low pitched sound to a solid higher pitched sound. The higher pitched sound generally means your on a stud. You can simply verify this using a small hammer and finishing nail to find the center of the stud. When painting trim around interior doors what type of paint is best for cleaning, but also looks nice? Most woodwork can be painted with a good semi gloss paint after the wood has a good coat of primer. 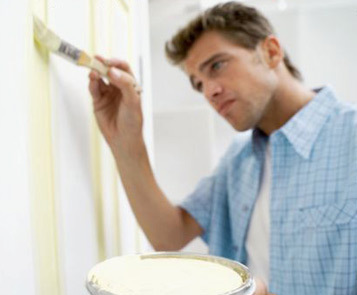 There are different grades of paint so don't by the cheapest paint and expect it to last. You are better off paying a little extra for a good quality paint because you generally will get what you pay for. Is there a specific amount of steps required on a staircase between levels of a house? Stairs are created by treads and risers and generally local building codes set guide lines as to the maximum riser height. Montgomery County allows a maximum riser height of 8- 1/4". If you were to take the total height from one floor to another and divide it by 8-1/4" inches this will tell you the minimum amount of stairs you will have: example 8'-7" (height from one floor to another) divided by 8.25" equals 12.48. This means that there will be at least 13 steps, each with a riser height of 7- 15/16". I'm preparing to sell my home and want to make some minor improvements. What small projects should I be looking at? The housing market has been pretty tough these days, with many homes up for sale for many months without any signs of a buyer. This makes it even more important to give your home an edge to convince prospective buyers a reason to choose your home over another. There are many small projects you can complete which will enhance the beauty of your home in preparation to put it on the market. One small project which will leave a great first impression is to replace your old builder grade door with a new custom door. 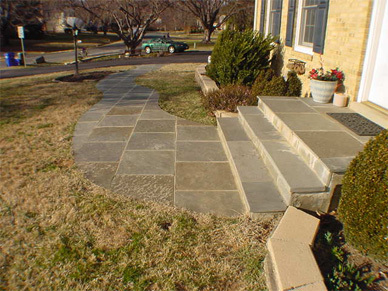 You can also change your old existing sidewalk and stoop to a new slate covered serpentine shaped sidewalk and stoop. Both of these projects are not overly expensive and can leave a great first impression and curb appeal to separate your home from your neighbors. Often the old sidewalk doesn't need to be removed and we can simply change it's shape by pouring new concrete adjacent to the old walk to change it's shape to a new curved or serpentine shape. The sidewalk shown below is an example of this method. Given the economy and higher energy costs, especially to heat our homes, what tips can you give me to help cut my heating bill this coming winter? Now is the time to check your home for leaks around windows and doors to make sure that the exterior caulking isn't cracked or peeling away. Change your furnace filter every month and more often if you are having any interior remodeling done. Replace builder grade windows with new Energy Efficient double pane windows and earn a credit on your taxes as well. What is the best material I can use to replace my decking of my old deck? 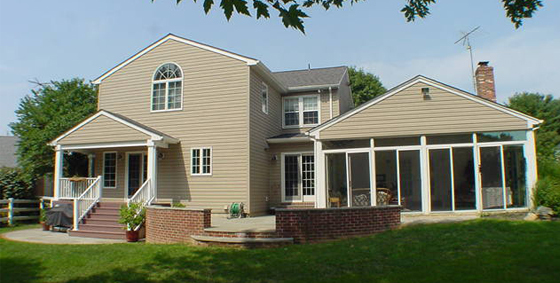 Trex is a popular composite which is being widely used. There are many types of composite decking materials, but Trex has been one we have had the best experience with. Why is it important to hire a general contractor to remodel my bathroom? There are many phases to remodeling a simple or complex bathroom, from the demolition to the selection the cabinetry, tile, and fixtures and scheduling the work of the various subcontractors involved. General contractors work with subcontractors on a daily basis, know their schedules and plan the project from beginning to end. Much time can be saved by hiring the pro's to complete the work.